W0045: Great Platform (Building 1) The Great Platform (catalogued as Building 1) is a perfect example of Post-Classic twin-stair temple design. Surviving examples are seldom found as they were systematically dismantled as part of the Christianisation of the Mesoamerican people. 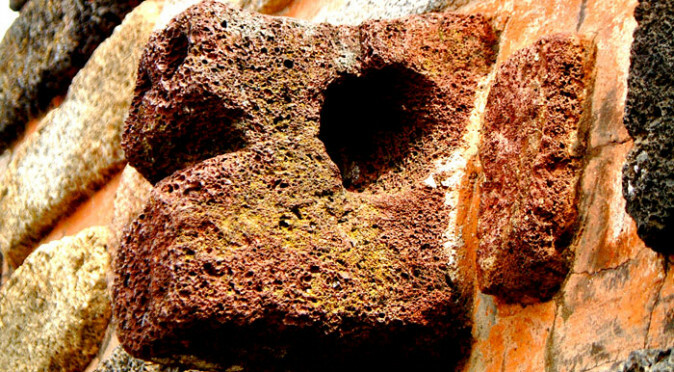 Probably the best known example of this style was the Templo-Mayor, which stood at the centre of the Aztec capital, Tenochtitlan. The Templo-Mayor was lost beneath Mexico City until the 1970s, but features in drawings and chronicles that were contemporary to its use and during the period when the Spanish first arrived in the capital. 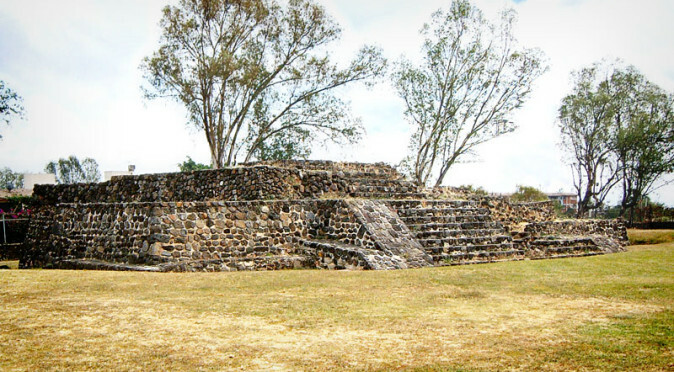 The Great Platform (Building 1) at Teopanzolco was also lost beneath the ground until the 20th century when Zapatista militants used it to mount artillery during the Mexican Revolution of 1910. 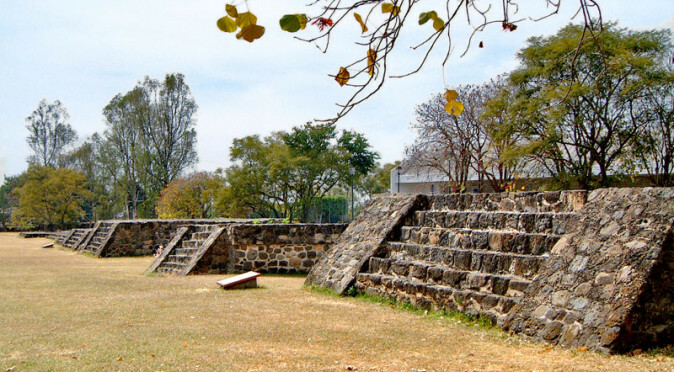 At this time, the Great Platform simply a huge mound of mud that provided a perfect gun-positioning from which to bombard Cuernavaca’s city-centre. However, the canons shook loose the mud and exposed this mighty double-stair platform (you can get an idea of its grandeur from the person walking past the rear left corner in image W0045). W0055: Inner Stairs of Building 1 as it appears from below, but is an independent stairway that is locked inside the outer platform. This means that the two ruined temples, that appear to be mounted upon the Great Platform, are actually inaccessible from the Great Platform and stand isolated on the inner temple (see fig. W0055). This sight is quite uncommon, but the process is not. The people across Mesoamerica believed in a sacred ritual known a “wrapping”, which probably relates to human burial practices and protecting the dead as the transit through the underworld. It is also probably symbolic of birth and rebirth. 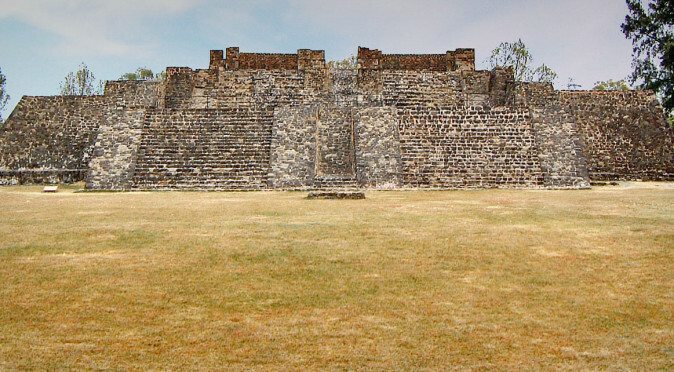 Many of the Mesoamerican cultures regenerated their temples periodically by building a new temple and encasing the older temple. 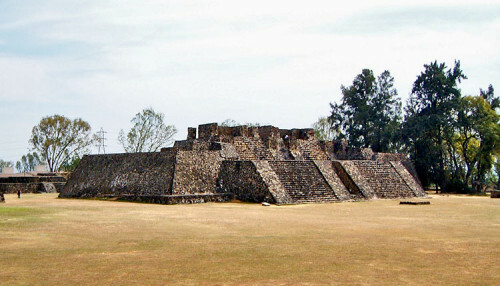 In fact, many structures have been found that have several older structures buried inside, such as Temple 10L-16 at that Mayan city of Copan on the southern perimeter of Mesoamerica, which has five previous incarnations buried underneath its current exterior, and the Templo-Mayor at Tenochtitlan, which was rebuilt 7 times. Seeing the older temple is a vary rare sight, because it is normally buried beneath the new structure and largely destroyed during the process of infilling – where the gaps (such as that seen between the stairways of the old structure and the inner-wall of the Great Platform in fig. W0055) would be packed with mud and rubble to support the new structure. 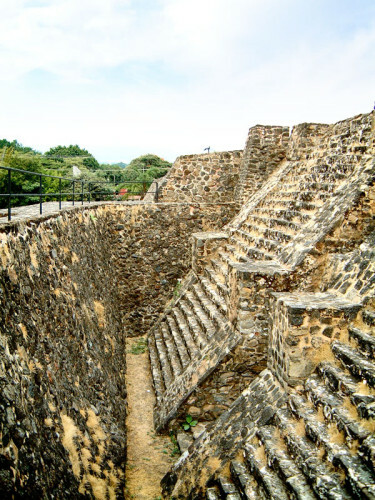 At Teopanzolco, it seems the builders were only a fraction of the way through completing a huge new construction that would have risen to approximately 15m and be topped by two new temples making the total height approximately 20m. 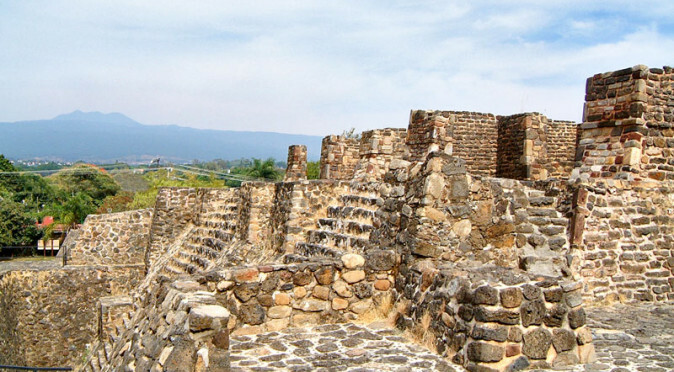 Why the construction was left incomplete is not fully understood, but it is thought that the site of Teopanzolco was abandoned in favour of a new political centre called Cuauhnahuac – which later became Cuernavaca.